Social Security is a key source of retirement income. Almost 58 million Americans received benefits from Social Security in 2013 with 70 percent of those benefits going to retired workers and their dependents. Eighty-six percent of seniors (age 65 and older) depend on Social Security as one of their most important retirement income sources. Considering the prominent role that Social Security benefits currently play, these benefits can be a key part of most retirement planning conversations. Timing is everything. The amount of a client’s Social Security benefit depends upon when they elect to start it. Retiring early is common. An Insured Retirement Institute (IRI) 2012 study showed that almost half (48.7 percent) of baby boomers expected to retire at age 65 or older. The reality is, however, that the actual average retirement age is 60, according to the 2012 Gallup Annual Economy and Personal Finance Survey. Deciding whether early retirement is feasible can be a stumbling block for many clients because the earliest age one may receive Social Security retirement benefits is age 62. 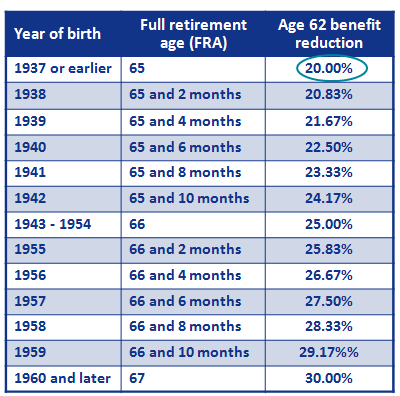 If a client takes their Social Security benefits prior to their Full Retirement Age (FRA), the benefit will be reduced – as shown in the chart below. Someone who retires at age 62 for example, will have drastically reduced Social Security benefits (up to 30 percent) if they have an FRA of age 67. Without the proper planning, a benefit reduction may have a drastic effect on their retirement income. Conversely, clients who delay taking their Social Security income past their FRA up to age 70 will have “delayed retirement credits” added to their accumulated benefits. The longer a client waits until age 70 to take their Social Security benefits, the higher their benefits will be. If a client has never worked or did not work enough to be eligible for their own Social Security retirement benefits, there may be spousal or survivor benefits available. A local Social Security office will have the most current marriage definitions as well. Losing a spouse is emotional. Adding adverse impacts to Social Security income on top of that makes the situation even more difficult. When a spouse dies and both parties worked long enough to receive benefits, the surviving spouse may lose some Social Security income benefit because the lower Social Security benefit discontinues after one spouse dies, allowing the higher income benefit to remain. Life insurance or an annuity can help make up for lost income. Divorce may complicate a Social Security strategy. Depending upon the duration of the marriage (10 years or longer), spousal benefits may be paid as early as age 62 to the divorced partner - if the unmarried divorced partner’s own Social Security benefit is lower than 50 percent of the ex-spouse’s benefit. Financial professionals may need to take into account the impact divorce may have on their client’s retirement income strategy. In addition to Social Security spousal strategies, financial professionals may need to help their clients plan supplemental income to meet retiree living expenses. According to the Social Security Administration, 51 percent of the 163 million workers covered by Social Security have no private pensions. Additionally, 34 percent of the workforce has no specific savings for retirement. Personal saving responsibility has increased as pension benefits decrease. But, financial professionals can help clients find possible solutions for supplemental income. 1. Discuss common sources of retirement income. Review the seven possible income sources in the chart below. Social Security may be the foundation of a client’s retirement income, but other income sources can help complete the picture. 2. Complete an income analysis for retirement. Add up all sources of estimated retirement income and then subtract estimated expenses. The outcome of that equation should reveal income gaps or surpluses. Identifying an income gap may help identify appropriate income sources. Additional factors also play a part in estimating income needs, including the health and longevity of the client, the impact of income taxes on their income sources and inflation’s effects. Supplementing income through continued employment is common. In fact, during the last five years, senior employment increased by 27 percent. Social Security retirement benefits are taxed based on the client’s combined income. Additionally clients receiving Social Security benefits prior to FRA who supplement income by working, may have a reduced Social Security benefit if they earn too much (see chart below). Clients should review any employment income they have to identify possible effects on income tax and Social Security benefits. After identifying the client’s key retirement income issues, create a plan for whatever lies ahead. Financial professionals can more effectively understand a client’s Social Security income by utilizing resources. Online resources are commonly available from many carriers. Keep in mind that clients should contact their Social Security Administration office for more information. Similar tools from other companies or vendors can help financial professionals as well. Many companies also offer Social Security planning collateral such as whitepapers and checklists. Beyond what financial services companies offer, the Social Security Administration website has a section specifically for financial professionals. This special section offers fact sheets and figures on the latest Social Security outlook. Local Social Security offices can also be great resources for financial professionals, sometimes having presenters available for client events or financial offices. Financial professionals can put a client’s retirement income pieces together using Social Security as a key part of the puzzle. By looking at the entire retirement income picture, financial professionals not only help clients plan for their future, but give them the ability to be flexible if situations change. The future of Social Security is uncertain – the Social Security trust fund estimates their reserves to be exhausted by 2033 so changes may occur with the Social Security system at some point. An uncertain future may be proof that financial professionals can play a critical role in helping educate clients on retirement income solutions - beyond what they receive in Social Security benefits. Deb Repya is senior director of advanced markets with Allianz Life. Deb may be contacted at deb.repya@innfeedback.com.